In my opinion there was a void among war heroes as they battled day and night in places away from home. In a certain way, it was the call of duty more than willingness to battle it out. While some of them took pride fighting it out, there were many who wanted the war to finish and return home. If the craving indeed gets worse, few men did take a chance to get back home while on duty. Kiss them for me, is a comical version of how three navy men, tired of war want to when the war was on. Cmdr Andy Crewson played by Cary Grant convinces his two colleagues to go away from navy base for a rest. Home sickness coupled with being away from loved ones made them rusty to have such a run away plot. They all land up in San Francisco and with the help of Lieutenant Wallace; they manage to get a luxury posh suite in a famous hotel. Andy manages to gather the party crowd and all looks like a great party time. Girls, alcohol, no war, life outside of being a navy pilot were better. Wallace in order to maintain relations with top businessman arranges for a meeting with Andy and the shipyard owner Eddie Turnbill. Turnbill wants to promote his war ships and to increase and motivate his fellow workers, requested Andy and his two decorated pilots to give a small talk at his factory. Andy refused and even embarrassed Eddie, but considering Eddie had good relations with the Admiral, he reversed his stand upon insistence of his friends who convince him. Helping Eddie would allow their leaves extended without having to spend the 'vacation' in a navy hospital for check ups. 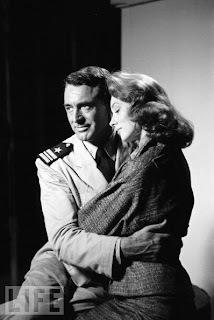 While Turnbill is happy making plans for the talk, Andy sets his eyes on Eddie’s fiancée Gwinneth Livingston, played by the stunning Suzy Parker. Gwinneth as evident from the first scene is an epitome of an unhappy woman who is in need of a stable life. Yet, in search of love, she isn’t quite in good terms with her relationship with Eddie. It was as though, love could blow away the relationship with Eddie. She ensures this point of hers is well expressed to Andy. Instead of turning up and talk to labours, Andy decides to spend the night with Gwinneth and takes her out to a music bar and a restaurant. He was here to enjoy his vacation, not talk about war. Andy meets his old friends from war, one handicapped and gets to know he has few days left. He is in a strange mood wondering he did the right thing running away from war while a lot of his country men are fighting it out. His two friends talk to labours on his behalf and this didn't go well with Eddie, fumingly tries to create a scene. Andy confronts Eddie and gives a blow instead of talking. Gwinneth breaks up with Eddie and joins Andy. Love is it. Party time is over guys as Eddie turns up the heat and ensures the holiday is cancelled. In the meantime, Lt Mc Cann gets the ticket to join Congress and he takes his two friends on board for this mission. The two friends get the call of war from inside; decide to join the navy instead. Mc Cann was not to be left behind; he gives up the ticket and joins his two friends. Suzy Parker in her role as Gwinneth makes her movie debut in an acting performance in a grand style. Previous was a cameo in the movie 'Funny Face'. Her beauty is the main strength in this movie, as her voice was given by another stunning actress of that era, Deborah Kerr. A special mention of Jayne Mansfield, who in the role of dumb blonde, makes a good impression and in major way imitates Monroe with her looks and talks. She is often mentioned as the poor man’s ‘Marilyn Monroe’ in reel and real life. Jayne’s character Alice Kratzner defines the title of the movie very aptly. In memory of her war husband in the movie, he tells her “Look me in all the war heroes and Kiss them for me”. 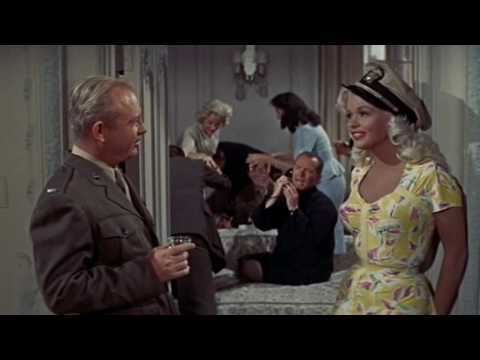 Famous for the song of the same name as the movie title by The McGuire Sisters, this 1957 Stanley Donen directed movie is a good watch about the back stage lives of war pilots.